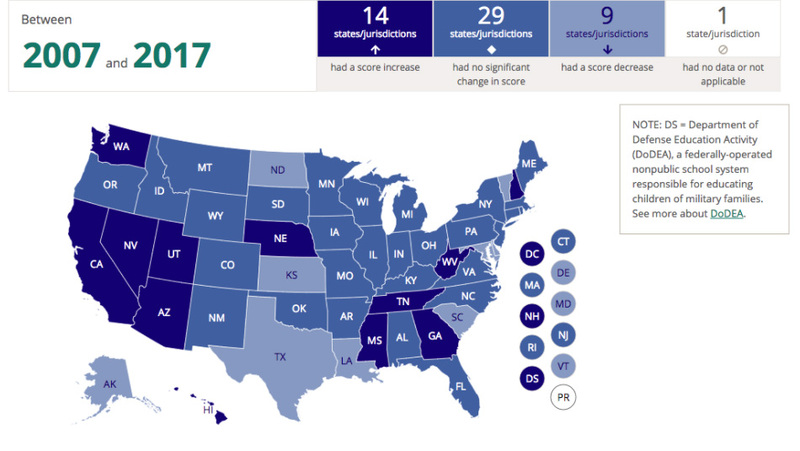 This week’s release of scores from the 2017 National Assessment of Educational Progress confirmed the gloomy suspicions of many in the education community: On average, American K-12 learning is stuck where it has been for several rounds of testing. But even while the country’s overall performance has been stalled since before the onset of the Great Recession, some jurisdictions have actually seen rising performance during that time. For several high-flying states and cities, in fact, the past 10 years represent a leap forward in academic success. In 19 states and the District of Columbia, test scores have made statistically significant jumps in multiple age/subject groupings during the lost decade. 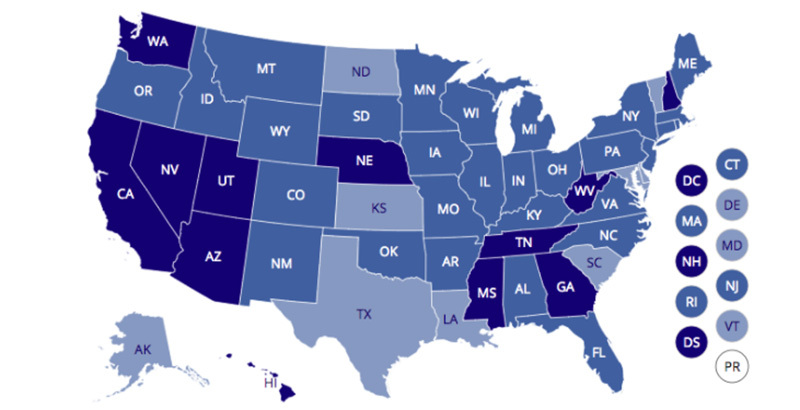 Arizona, California, Florida, Hawaii, and Nevada all saw improvements in three out of four age/subject groupings. Mississippi, one of the bottom-performing states for education in the country, made progress in all four, as did Utah and the District of Columbia. D.C. has been NAEP’s happiest story over the “lost decade,” gaining the most ground of any jurisdiction in fourth-grade reading (16 points) and both fourth- and eighth-grade math (18 points). In all three groups, the District’s total increase in points since 2007 was at least double that of any other state. The period when this progress occurred coincided with a decade of aggressive academic reforms, including mass closures of failing schools and the debut of a revamped teacher evaluation system, that were precipitated by then-Mayor Adrian Fenty and then-Chancellor Michelle Rhee. D.C.’s halo as a reform capital has dimmed recently with the exposure of widespread inflation of high school graduation rates (and a bevy of smaller scandals besides, one of which recently forced DCPS Chancellor Antwan Wilson to resign). But the city can justifiably say that its students have made the biggest strides anywhere in the country over the past 10 years. Other top-performing cities include Chicago and Atlanta, which have both seen statistically significant gains in all four age/subject groupings of NAEP’s Trial Urban District Assessment (a group of 27 large urban districts whose test results are measured and tracked like states) since 2007. Scores in Los Angeles have jumped in three out of four groupings, and San Diego and Boston have made improvements in two out of four. A note on urban results: Though the TUDA program began in 2002, many districts have only recently volunteered to participate. Consequently, some districts of interest don’t have long-running NAEP records. But just since 2013, late entry Miami-Dade County has boosted its scores in fourth-grade reading and math. Unfortunately, the news isn’t pleasant for every mayor and governor. Ten states (Alaska, Delaware, Kansas, Montana, North Dakota, South Carolina, South Dakota, Texas, Vermont, and Wisconsin) saw declines across multiple age/subject pairings. Alaska, Delaware, Montana, North Dakota, and Vermont have all seen major declines in student scores in three out of four groupings since 2007. For cities, the biggest losers since 2013 include Philadelphia (down in fourth- and eighth-grade math), Dallas (down in fourth-grade reading and eighth-grade math), and Baltimore (down in fourth- and eighth-grade reading and fourth-grade math). It’s also worth keeping in mind that this year’s test departs fairly radically from previous iterations because it was administered to students on tablets rather than with paper and pencil. The shift has spurred some speculation about whether low-income students, who are less likely to access information technology at home, would see their scores artificially depressed due to unfamiliarity with the testing format. Go Deeper: This is part of The 74’s ongoing ‘Big Picture’ series, bringing American education into sharper focus through the newest research, data, and surveys. See our full series.